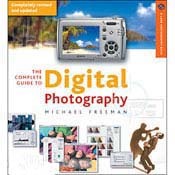 It's the bestselling, most complete guide to digital available - The Complete Guide to Digital Photography, 3rd Edition - with more than 300 color photographs--now thoroughly updated to offer the latest information. Completely revised to cover all the rapid progress made in digital technology, this unparalleled guide looks at all the latest technical features gracing new cameras, and teaches the timeless skills that will always make better photos, no matter what the equipment. It contains a full round-up of everything amateur or professional photographers need in order to start taking digital photos: comprehensive coverage of hardware and software; a discussion of essential techniques; and easy-to-follow projects. There's information on the most cutting-edge cameras with their large resolutions, on the great lenses made especially for digital, and on the updated programs--all with higher memory and storage capacities--for processing digital photo files. And all that knowledge is still conveyed in the same straightforward, stylish manner that has earned this book so many plaudits in the past.